The lowdown: If IPA is the workhorse brew that built the craft beer movement, imperial stout is the rock star: extreme, somewhat rare, and often known to inspire hysteria in the form of lines snaking around breweries, full of fans hoping to buy some limited edition. Imperial stout is what English brewers called the hopped-up, higher alcohol version of stout they shipped to Russia at the request of Empress Catherine II. Stout was a technological improvement on porter, itself the first industrially produced beer in the world (and a huge hit with the English working class). Two centuries later, American craft brewers tried to recreate the style still being produced in eastern Europe and England. They were so successful that brewers started slapping the “imperial” designation on all sorts of beer (IPA, pilsner, brown ale), even without the involvement of a sitting monarch. Most beer drinkers are familiar with stout thanks to Guinness’ ubiquity, but imperial stouts are different. They have significantly more alcohol—at least 9 percent ABV (alcohol by volume), but sometimes as high as 15 percent. Like their historical forebears, American interpretations of the style are dark, chocolaty, roasted affairs, but they also often include ingredients such as vanilla beans, chili powder, maple syrup, coffee, and marshmallows. Beyond that, many are aged in bourbon barrels to add additional layers of flavor. But barrel-aging for months or years is an expensive endeavor, as is sourcing large amounts of vanilla beans or other add-ins, so most breweries make far less imperial stout than other styles such as IPA or hefeweizen. Scarcity drives demand—thus those lines outside breweries on release day. The taste: A basic imperial stout should taste roasted and feel substantial going down. Flavors of dark chocolate, coffee, and dried fruit should open up as you savor the aftertaste. Unlike many other beer styles, this taste should linger for awhile. As your glass warms up, look for slightly different flavors to come to the fore. If you’re drinking a bourbon-barrel-aged imperial stout, you can expect notes of vanilla and caramel. And if the label lists any additional ingredients, you should be able to discern their individual flavors as well. Possible gateway: Old Rasputin by North Coast Brewery is a great place to start with imperial stouts. It’s a straightforward attempt to recreate the historic style, and the resulting beer has produced a trophy case full of awards since 1996. Try this one before branching out to more ambitious styles, because even with a basic imperial stout, there are many layers of flavor to appreciate. It’s rare to visit a Trader Joe’s and not see this beer on the shelf. Goose Island Brewery claims its Bourbon County Stout was the first beer to be aged in a bourbon barrel. Though the year the brewery actually tried its experiment is in dispute, the results are not: Bourbon County is the standard against which all other barrel-aged stouts are measured. Since Goose Island was purchased by Anheuser-Busch, it has substantially increased production of Bourbon County. Now it’s released nationally on the day after Thanksgiving, with long lines forming outside liquor stores across the country. In 2015, Goose Island released six different varieties of Bourbon County, but had to recall four of them due to infection. This past Black Friday, it was down to four varieties (three if you don’t live in Chicago, the only city where the Proprietor’s version is sold). Still, don’t let the Black Friday lines or its “rare” designation scare you. There always seems to be a hidden reserve of Bourbon County that hits bars or sometimes grocery stores a few months into winter. Another worthy option is DinoSmores by Off Color Brewing, which boasts all the taste of a s’more in a beer. It’s far more subtle than that sounds, its flavors evoked mostly by vanilla beans and shrewd brewing. Next steps: If you’re ready to graduate from mere stout enthusiast to stout fanatic, you should consider venturing to Munster, Indiana to try and procure a bottle of Dark Lord by 3 Floyds. Available on just one day a year in April, it’s the beer that kicked off the release day line trend with its debut in 2005. Though opinions of the beer and brewery have fluctuated over time—for several years it was considered the best beer in the world according to Beer Advocate, though it now ranks at No. 15—there’s no denying the frenzy Dark Lord has long stoked in beer lovers. Eventually the brewery’s small annual Dark Lord Day celebration grew into a full-fledged festival featuring (mostly metal) performers from Eyehategod to Big Freedia. 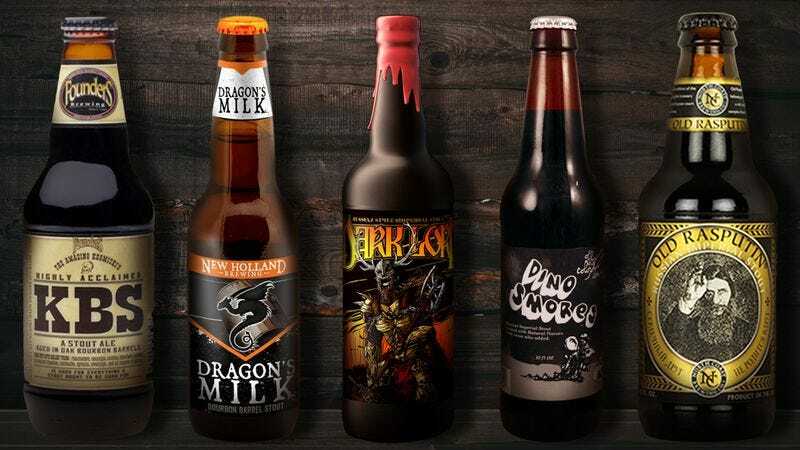 As that might suggest—and unlike many imperial stouts—Dark Lord isn’t overly concerned with going down smoothly, with flavors that are intense to the point of being bracing. At Dark Lord Day 2016, one $200 ticket yielded four bottles of Dark Lord, plus one bottle that was randomly chosen from the 20 different varieties of barrel-aged Dark Lord produced during the past year. It was worth every penny.